Verdi’s masterful transposition of Shakespeare’s play to the lyric stage received its second HD transmission by the Met. Zeljko Lucic again played the title as in 2008. But today’s focus was Macbeth’s frightening spouse impersonated by Anna Netrebko. The Russian diva has undergone an astounding transformation since her Met debut more than 12 years ago as Natasha in Prokofiev’s War and Peace. Her second role was Zerlina in Mozart’s Don Giovanni. She was a soubrette, now she’s concentrating on the big Verdi dramatic soprano roles. She admitted during her intermission interview that this metamorphosis surprised her as much as it did her audience. Simply put, Netrebko is the best Verdi soprano since Zinka Milanov, and she can act – Anna not Zinka. Her voice is rich and even throughout its range. 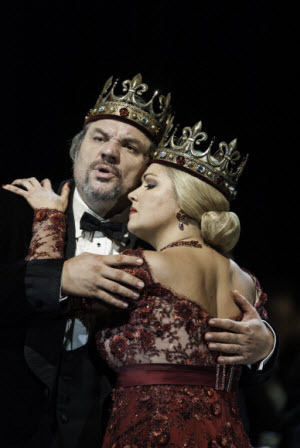 Rare is the singer who can simultaneously combine beauty and dramatic impact as can Netrebko. Lady Macbeth is a notoriously difficult role, yet Netrebko made it all seem easy and effortless. Wearing a blond wig she inhabited her part. So secure are both her vocal and dramatic skills that the viewer forgets the difficulty and is drawn into the action. ‘Vieni! t’affretta! !’ and ‘La luce langue’ were delivered with such compelling urgency that the full force of Lady Macbeth’s malignant drive and lust for power were palpable. The Sleepwalking Scene was another tour de force. Here Lady Macbeth has driven herself into another world. Over the next few years the Verdi canon should be Netrebko’s and thanks to modern audio-visual technology her art will remain after her skills have gone. A great artist! Zeljko Lucic is a very good Verdi baritone who did a fine job with one of opera’s greatest baritone roles. He sound is sometimes a bit woolly and his middle range lacks the dark sound that best suits Verdi. His singing of the last act aria ‘Pietà, rispetto, amore’ was delivered with feeling and sensitivity. He did not insert a high A-flat at the piece’s end as many of the great Verdi baritones with a strong top often did. The number is one of the best examples of Verdi’s propensity to make his villains sing like angels. Verdi considered the opera to have three principal roles – the Macbeths and the witches. Shakespeare had three, Verdi gives us a platoon. I’ve gotten used to them since I first heard the opera at its Met premiere in 1959, but they are a strange lot especially when they are instructed to move like a bunch of psychiatric patients with tardive dyskinesia secondary to long term anti-psychotic medication. Director Adrian Noble moved the action from 11th century Scotland to some undetermined site circa World War II. There were a lot of automatic weapons and even a Jeep. None of this mattered much, though I don’t think it enhanced anything either. The two other leading parts aren’t very important, but they were very well cast. Tenor Joseph Calleja has almost lost the bleat (or rapid vibrato, if you prefer) that has characterized his work thus far. By the time he’s 40 (3 years from now) it should be gone. He has a bright and attractive voice with the bleat gone he could be a great tenor. The reason a star tenor takes the role is ‘Ah, la paterna mano’ which Calleja sang with ease and vocal beauty. Banquo is another relatively small role that received luxury casting. German bass René Pape gave a distinguished reading of what for him is a very easy role. ‘Come dal ciel precipita’ his second act aria was nobly done and once again Fleance got away. Macbeth was written in 1847 and revised in 1865. Thus it is a product of both Verdi’s early and middle periods. Fabio Luisi gave a magnificent reading of this great score. The tautness and propulsion that Verdi demands was there from start to finish. The great concertato endings to the first and second acts were delivered with passion and sweep. Luisi is a true Verdian. The chorus which is a very big part of this opera delivered their music with all the power and melody that Verdi demands. Though Netrebko was the biggest reason to watch and listen to this opera, the whole performance was at the highest level. A Verdi masterpiece masterfully realized. NO!!! “a lot of automatic weapons and even a Jeep”…. STUPID!! Atmosphere and setting is an important part of this opera. .